It seems that his campaign pictures are being put up across Beirut and the presidential sash is ready. He has been there before and done that before. But does this mean he can’t do it again? When he was first elected in 1958, President Fouad Chehab presided over one of the most -if not the most – stable and prosperous periods in Lebanon’s history. A determined man with a clear vision, he fought against traditional politicians – a deep-seated oligarchy of feudal chieftains and warlords, the “cheese eaters” as he likes to call them – to modernize the state and reform its institutions. If nothing else, he was able to build strong foundations for change in a single term as president, which if re-elected, he has promised to pick up and continue to develop where he left off in 1964. (It is rumored that roads that have never been rehabilitated since 1964 and water pipes that were installed in 1963 and never changed since anxiously await Chehab’s re-election). In 1958, Chehab presided over a smooth transition from one of the most challenging crises Lebanon had faced in its post-independence era. 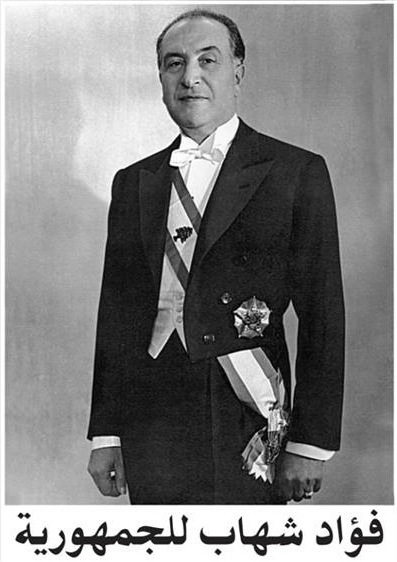 He dealt with it in the same way challenges must be dealt with today, in a multifaceted approach of equitable socio-economic development with a focus on social justice, with an applicable “Made in Lebanon” foreign policy and an attempt to lessen the influence of the traditional, corrupt political well-established establishment. Today, as Lebanon’s Parliament starts the process of electing a new president for the next six years, in view of similar challenges we faced 56 year ago, only means there is one person for the job. The fact that we had one man to do the job then, only means we should have the same man to do the job now. He may have been the right man at the wrong time then, but he is the right man at the right time today. Because Lebanon needs a strong leader today more than ever…Fouad Chehab for President, Fouad Chehab for the Republic! After 50 years of waiting, the people want you back, Mr. President. I’m studying the modern Middle-East at university at the moment, and it was inspiring to learn about such a wise and good leader, though sad knowing what would happen after he left office. The Middle East (and the world) could do with more leaders like him! Previous PostPrevious April 13: How can we not forget?